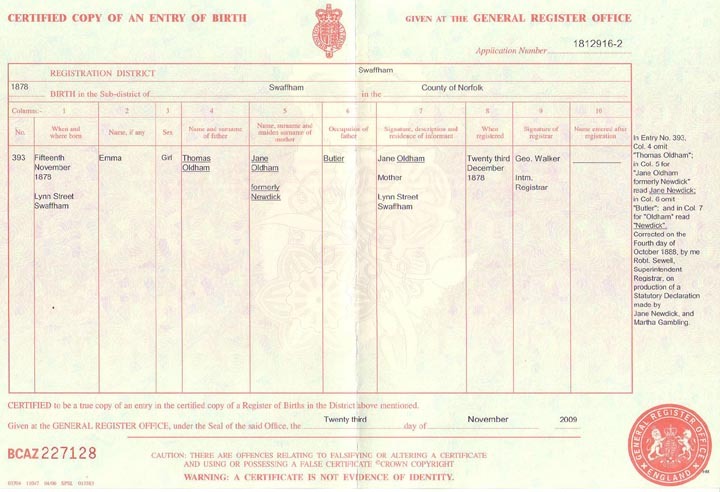 Emma Oldham/Newdick's birth registration was shared by Adrian Greenwood. and a copies ordered from the General Register Office. Here are enlargments of the "important" parts of Emma's Birth Registration. When Emma's birth was registered on December 23, 1878 the parents were shown as Jane Oldham (formerly Newdick) and Thomas Oldham. On October 4, 1888 Jane had Thomas Oldham omitted, her name changed to Jane Newdick and Emma became Emma Newdick. We can only guess that Jane had in some way separated from or "broken up with" Thomas Oldham and decided to revert to her maiden name. It is an interesting coincidence that the Superintendent Registrar who made this change over 120 years ago was named "Robt. Sewell", the same name as the author of this page who is Emma's cousin twice removed. Click to return to Emma Oldham/Newdick on the Newdick page.